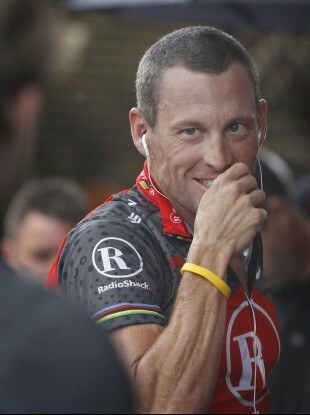 File picture of Lance Armstrong in 2010. LANCE ARMSTRONG ENDED his year of apologies and gradual redemption with a New Year’s greeting to one of the journalists who exposed his cheating ways. The Texan, who had his seven Tour de France titles stripped from him in 2012, began 2013 with admissions of blood-doping and drug taking during the high point of his cycling career. He has since met, or spoke to, nearly every one of the short but dedicated list of accusers. Further apologies have been forthcoming and further sorrow expressed. Armstrong has still to meet journalists David Walsh or Paul Kimmage in person. The Irish duo were instrumental in pursuing his crooked ways during and after his career. Kimmage was asked, via Twitter, last night if he had any plans to visit Cork in 2014 to discuss Armstrong. He kindly responded that he had made it a New Year’s resolution not to speak about the American. Armstrong, himself, responded. Kimmage began his resolution a few hours early and did not respond to the Armstrong tweet. Email “Lance Armstrong sent Paul Kimmage a Happy New Year tweet last night”. Feedback on “Lance Armstrong sent Paul Kimmage a Happy New Year tweet last night”.